Tabbouleh is a Mediterranean vegetarian dish traditionally made of tomatoes, finely chopped parsley, mint, bulgur and onion, and seasoned with olive oil, lemon juice, and salt. This recipe uses lentils rather than bulgur so it is gluten-free for those who suffer an intolerance to gluten. The combination of the herbs, radishes and grapes with the feta gives this dish a delicious flavour. I had guests coming for the weekend so I prepared the lentils and onion mixture earlier in the day; chopped and sliced all the vegetables and grapes so that I could quickly toss it together when we wanted to eat later that evening. As I doubled the recipe, the remaining salad kept beautifully fresh for lunch the next day. The recipe suggests that it serves two people (I doubled up for four) but if serving with additional dishes, these are very generous servings. Cook the lentils as per instructions on the packet. Don’t overcook them as they should still hold their shape. Drain and season with salt, pepper and a little olive oil. Put to one side. 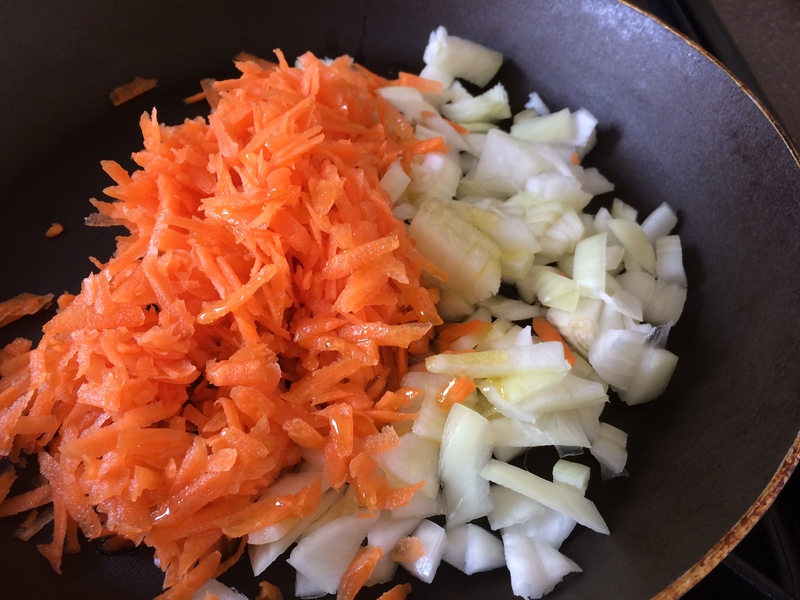 Finely chop the onion and carrot (I grated my carrot) and sauté in a little olive oil until soft. Add a good handful of the chopped mint and parsley to the onion whilst it is still warm, together with the cooked lentils. De-seed the cucumber and slice; chop the peppers into small pieces; thinly slice the radishes after topping and tailing them, halve the grapes and tomatoes. Mix together the lentils/onions with the other vegetables and the grapes. Add the rest of the herbs and season with salt, pepper and sumac making sure everything is well combined. Crumble over the feta. Mix together all the ingredients for the dressing and serve on the side. The tasty dressing perfectly complimented this dish as well as being a superb dip for the Falafel balls which I served alongside the Tabbouleh. 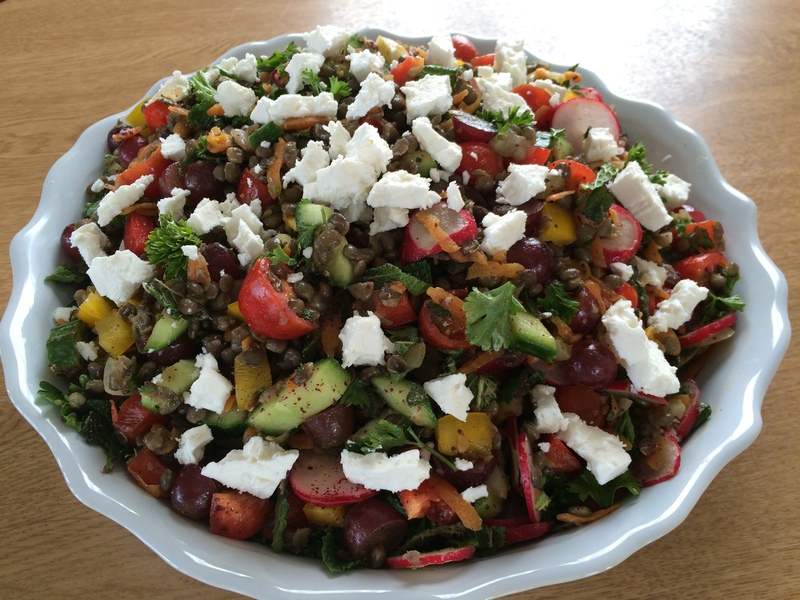 Recipe adapted from the book Thrive on Five by Nina and Jo Littler. NB: All photographs used in this blog have been taken by me, and are of food I have prepared myself. This entry was posted in Brunch, Dinner, Lunch, Salads, Vegetarian and tagged Dinner, Feta, Gluten Free, Healthy Eating, Lentils, Lunch, Peppers, Red Grapes, Salad, Sumac, Supper, Tabbouleh, Tomatoes, Vegetarian. Bookmark the permalink.